A starter relay closes contacts to switch on a larger current from a small current coming from the ignition switch circuit. In this way, it acts as a switch for the starter solenoid and the starter motor in an automotive. Starter relays rarely become faulty, but when they do, it can mean a lot of trouble because your car will not start. Several things can cause a starter relay to fail, including corroded contacts, a faulty circuit, contacts that weld together, or just a relay that’s too old. 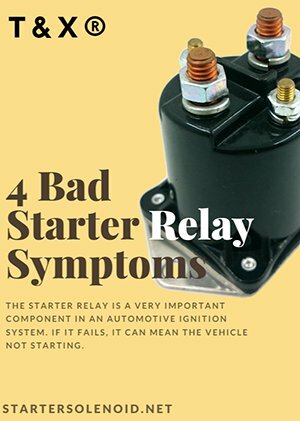 A bad starter relay will show 4 common symptoms. Failing to start the car is one of the main signs that a starter relay has become damaged and needs immediate checking. If you switch on the ignition and the car remains silent; no clicking, not anything, it means there’s no current flowing through the relay’s coil. So the coil doesn’t magnetize strongly enough to attract the armature to switch on the battery circuit. The end result is zero current flowing through the starter solenoid and the starter motor, and the engine cannot start. Switch on other car accessories or devices that use the battery to confirm if the battery is working and in good condition. If the battery is confirmed not to be dead, the starter may need repair or total replacement. Rapid clicks show the relay is not delivering enough current to attract the armature. As it tries to unsuccessfully close contacts during the on and off, the result is a series of clicks. A possible cause of this problem could be insufficient conductivity due to contacts burning out or worn out leads that minimize the amount of the current flowing. Both can result from an overly aged relay whose efficiency has deteriorated. 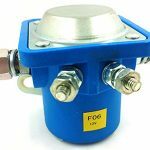 Repair for the fault is by ensuring current flows through the relay coils uninterrupted, and that the contacts are free from dirt and corrosion. The contacts can be scraped to remove the corroded surface by use of a sandpaper. In the case of a relay that has stayed for too long, a new one would easily solve the problem. When you switch on the ignition key, the starter relay switches on, and the starter motor and starter solenoid begin operating. Switching off the ignition key or button should have the opposite effect: the motor and starter solenoid should stop operation. If this doesn’t happen and the starter relay remains on even long after the engine has started, the relay is faulty. It could be that the relay’s contacts have welded together, something that happens from exposure to high currents over time. You should take immediate action because this kind of fault can result in damage to the whole starter system. There are times when starting the engine fails, but on switching the ignition key off and on again, the engine starts. This symptom indicates a possible damage to the starter relay. Mostly, it has to do with a build-up of dirt and debris on the contacts or leads from prolonged exposure. The dirt causes an occasional decrease in the current flowing through the circuit. Cleaning the contacts and examining the leads for breakage and discontinuity can help eliminate the problem. A starter relay doesn’t contain many moving parts except for the armature, so it rarely breaks down. When it does, it’s usually something to do with failure in electrical conductivity in the relay’s circuit. The starter relay is a very important component in an automotive ignition system. If it fails, it can mean the vehicle not starting. Starter relays need continuous monitoring to ensure they’re working properly. In case of failure, replacing them is always the best option because they’re not costly to buy. We will reply you in 12 hours.